Slammed bars, sad bulldogs and the suitcase of painful paychecks. The tour rolls around once a year and makes everyone who isn’t a pro Euro racer look like a slouch. The rolling soap opera that is the Tour speeds around France, with super fit riders riding tiny bikes in impossible aero positions. John S., who works here, told me that Cadel Evans’ saddle to bars drop on his time trial bike was 23 centimeters. 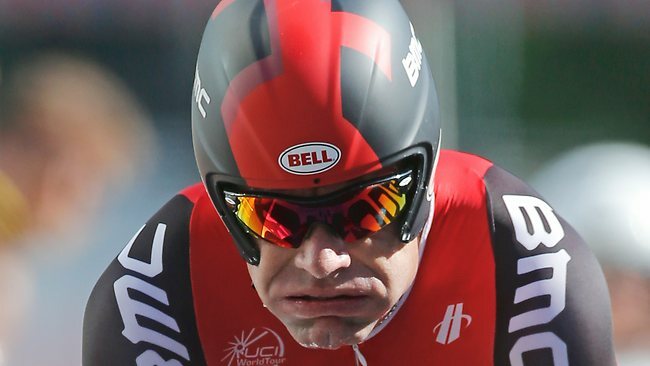 Cadel’s position is crafted in a wind tunnel. How does it feel? See below. That’s 9 inches, or 7.5 inches more than we would recommend to anyone in our fitting process. He wears a skin suit so tight that riders often complain of difficulty breathing, like Victorian ladies on warm summer days. He uses a water bottle that just has enough liquid in it so that it can be counted as a water bottle, not a liquid aero faring. Read that again. It’s not for drinking, its just there to make him go faster. The man is paid to suffer. That’s why he looks like a sad bulldog all the time. Pros are not paid to look at the view, or to talk with their friends, or really to do anything that makes cycling enjoyable. Often, to get more aero, they look at their front hubs, not even the road in front of them! They are paid to go as fast as they can, no matter what. If they go numb, or suffer tendonitus or have horrible hand pain at the end of a tour, but they won, that is what matters. Saddle sores and foot pain are nothing compared to a paycheck and glory. Don’t discount peer pressure. When racing, even stateside, there is a desire to copy the fastest guys, and if they have an ultra agressive position, everyone else wants it too. The fastest guy might do 300% more yoga, and have a lower back that is ‘strong like bear’, but there is also a copy cat environment in the peloton. If rider A is riding a really aggressive bike, and wins, other riders will copy the position, even if it isn’t right for them. They want to look the part, even if it means being less biomechanically efficient. This of course makes no sense, except from a psychology standpoint. It’s all about feeling fast, apparently, not actually going fast. There is a good amount of solid data showing that fatter tires are faster than skinnies, but loads of people still reach for the narrow tires, citing personal weight concerns, or just saying ‘it’s what i am used to’, which is like saying I am used to riding bricks around, and wish to continue, even if its less comfortable, less safe, not as fast, and harder on my race wheels. Skinnies look fast. So do slammed bars, and stiff aero wheels, and tons of exposed seatpost. There are tons of blog posts and articles and comments in forums on how bad *** it looks. Case in point, SLAM THAT STEM, a blog devoted to destroying your Ulnar Nerve. 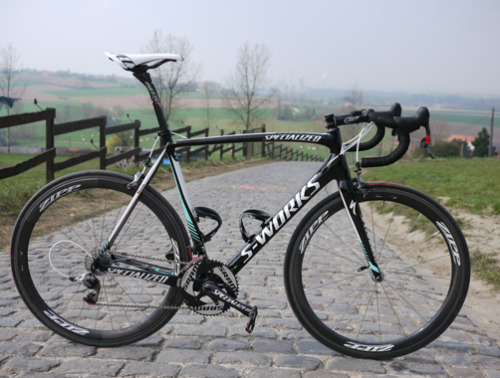 Tom Boonen’s Spring Classics rig, taken from SLAM THAT STEM*. Do you think he won because of the position or the huge 30mm custom tires at 60psi? I’m guessing the latter. *caps lock from the blog’s title, repeated to illustrate the mentality of the author of said blog. The sad thing with this phenomenon is how it shuts down a great place to ride: in the handlebar drops. The vast majority of pro riders spend most of their time on the ramps and top of the bar, or hanging over the front, in a fake time trial position (needed because their bikes are too small). When bikes are sized correctly, a few things happen. One: you can breath better. If you are in a horrible, crunched up position, with your diaphram completely compressed, breathing becomes a chore. Two: the bike handles better. Bikes are designed around certain stem lengths, and 140mm-150mm stems are outside of the projected range of what the manufacturer designed the bike around. Wanna know why there are so many crashes in the tour? They are going really fast and their bikes handle like a scared rabbit on crystal meth. This does not make the bike faster, in fact, fighting the bike to keep it stable saps critical energy. Eddy lays it out in Mexico with some long chainstays, aero Brylcreem and hand knit white socks. Gloves? Not Aero! 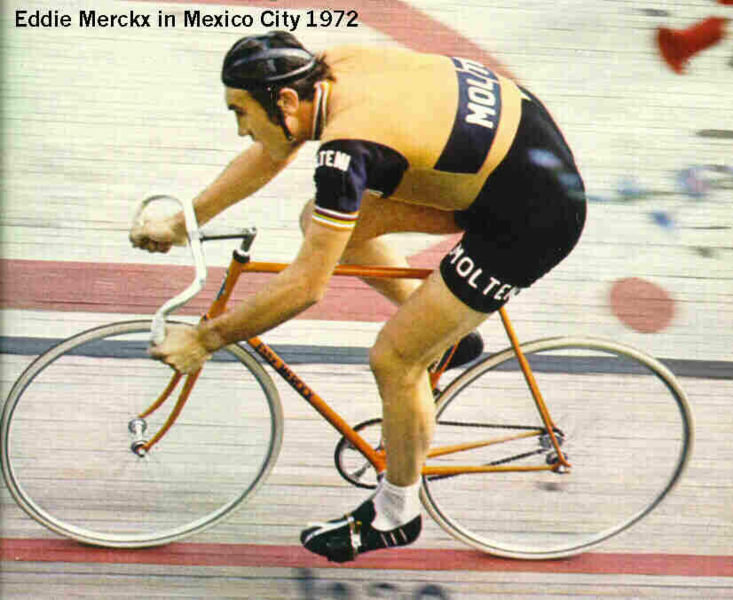 Eddy Merckx’s hour record bike had long, touring bike length chain stays, so he could go as fast as possible without fighting the bike, thereby putting all his energy in to going fast. Three: you have less pressure on your soft bits. If you are crunched over, you hips are rotated and you are barely sitting on your sit bones. We need to sit on our sit bones, not soft tissue, so that we can use our bone structure to put power to the pedals. Soft bits are soft, and they squirm around, hardly a solid foundation to lay down some speed. Lastly, Four: Little bikes and big riders make riders look like they are on clown bikes. Like their parents couldn’t afford to get them the next size up. Do we really want our heros riding circus bikes? All of this of course relates to fitting, and if you are a regular reader of the blog, you know I don’t often plug stuff here at the shop, mainly because I am bad at it. We do fits at the shop, we’re pretty good at it, Brian and I having done literally hundreds of them. If you think your bike fits well, but could be a little more comfortable, or more aero, or you have an injury you are working through and want to adapt the fit, we can help you with that. Check out our article on fitting, which is 87% complete, basically lacking in pictures and scientific looking diagrams. Riding thru the Wtfacolfsville valley, often visited by the Wednesday nite crew, and the Sunday nite crew. The women’s ride is geared toward most ages and most abilities. It’s still a road ride, not a casual family saunter though, so bring a road bike, please! Bike Doctor Frederick Shop Rides, bike doctor in the world at large, bike fashion, Bike Technique, Frederick Riding, Lots of Pictures for the Illiterati, Tour de France, what's your epic?